The Biesuz family (Val, Pedro and Eloy) show off their new artwork, “Spirit of St. Louis” and “Spruce Goose” from the Martin-Young Aviation Collection. Banyan Air Service and Steven F. Greenwald Design, Inc. have teamed up to provide an aviation art display in Banyan’s lobby. The display includes The Martin-Young Aviation Collection created by artists Frank Martin and Judeen Young. They have fused their award-winning artistic techniques to create an aviation art collection ranging from the evolution of flight and classic military aircraft to today’s latest commercial and general aviation aircraft. Their unique skills combine to form a hybrid collaboration of abstract paintings and collage techniques. 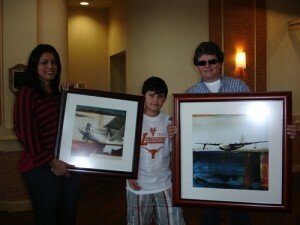 Mr. and Mrs. Eloy Biesuz and their son, Pedro, stopped to look at the artwork in the lobby and purchased two pieces to take home to Brazil on their Lear 45. “We liked the subject matter and the aircraft featured in the artwork and thought they would make a great addition to our office. We get nice comments about the uniqueness and the bright colors,” said Mr. Biesuz. The Steven F. Greenwald Design aviation art display will remain in Banyan’s lobby until the end of November. Pieces can be purchased right from the lobby display, on-line at BanyanPilotShop.com/art or in Banyan’s Pilot Shop. The Pilot Shop is located at Fort Lauderdale Executive Airport next to Banyan’s FBO terminal and is open 7 days a week. The store carries a wide selection of The Martin-Young Aviation Art Collection and offers assistance on customized orders; including specific aircraft, different sizes and framing options. World-wide shipping is also available. For more information, contact: dgreene@banyanair.com.